Golf for kids is all about fun and getting them excited and interested in taking up the game. Getting kids interested in golf at a young age can be no easy task with all the other activities available for a child in today’s world. Parents who enjoy the game might want to try to get their children to follow in their footsteps. There are certain things you can do to pique their interest in the game without applying pressure on them to play. Take your kids to a miniature golf course at a young age. The fun kids can have there might make them wonder how much more fun regular golf can be. Stress the physical fitness aspect of golf. Let him know what great exercise golf is for the body as well as the mind. Be sure he doesn’t associate golf with work, such as having to carry a heavy bag while you play. 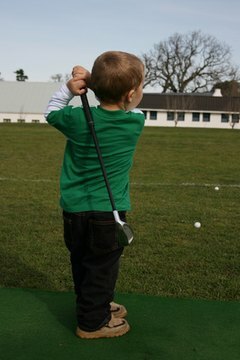 Bring your kids to the driving range. Allow them to bring a friend or two, and then without trying to get them to have a perfect swing, let them all hit some balls. This can be a fun time that will help them to look at golf in a different way. Take your kids to play with you, but do it when there is very little traffic on the course. This will keep any pressure he or she might feel from being watched or hurried to a minimum. Be on your best behavior no matter how you are playing so your kids don’t link golf to profanity and/or throwing a tantrum when a shot goes off target. Watch a PGA Tour event with them live or in person. While watching on television can be exciting, especially if the tournament is a major or is being hotly contested, nothing beats seeing how far the pros can hit a golf ball in person. Find out when the closet PGA Tour event is going to be to your location and go about getting tickets to attend. Start her playing on a course that she can handle. The par-3 course closest to home or a public course that lacks length is the best place for a kid to learn the ins and outs of golf. The chances of being successful are much higher than if you took them to the toughest venue in your area. Avoid any direct competition between yourself and your kids on the course until they have gained some experience. If you do wind up playing against your kids on the course, do so under match play rules, where the best score on a hole wins. Any holes a child wins will give them a positive memory of that round and only further encourage him to pursue the sport.